Salsa Rossa is Italy’s answer to a Mexican salsa. Instead of making it chunky it is smooth and pureed almost like a tomato sauce, but this uses a few fun ingredients you’d never find in a salsa. For starters, it contains old bread. The bread adds some thickness and after it is soaked in vinegar adds some acid to brighten it up. It also contains peppers, carrots and tomatoes, letting the dish become more of a bright orange after pureeing instead of a deep red, which you may be used to with salsa or sauce. Every dish tastes better with a delicious sauce accompanying it – especially tasty meat entrees. 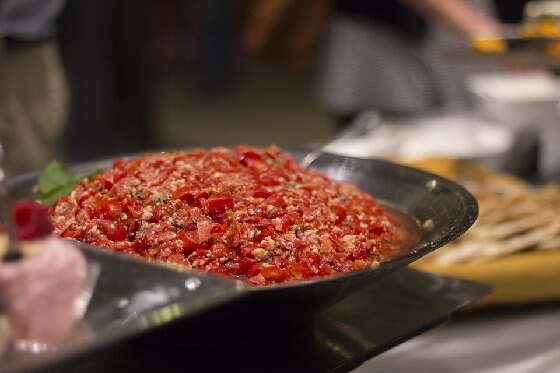 This traditional Italian Salsa Rossa will be a fantastic complement to all of your meat dishes and is quick to prepare. The key is the use of vibrant red peppers, a saute of garlic and carrot for flavor, and vinegar-soaked bread to add thickness and texture.